PARIS, Jul 18 2012 (IPS) - In July 2007, many Parisians laughed at their mayor, Bertrand Delanoë, when he announced the creation of a public bicycle sharing system aimed at reducing traffic in the French capital. The system was called Vélib’, a combination of “vélo”, which means bicycle in colloquial French, and “liberté”, or freedom. During its first few months of operation, the skeptics appeared to be right. While most Parisians snubbed the heavy public bicycles (weighing 23 kg), others destroyed or stole them. During the first year, 8,000 Vélib’ bicycles disappeared and another 16,000 were vandalized, according to official figures. A number of other factors worked against the urban cycling initiative: the subscription requirement, the high cost of the service, the physical exertion required, which in the summer leads to certain side effects undesirable to a population famous for its polished personal appearance, and the chaotic Paris traffic, feared for its high risks. But despite it all, when Vélib’ marked its fifth anniversary on Jul. 14, it was also able to celebrate its undeniable success: in five years, 138 million people have used the 23,000 rental bicycles, and the system currently has 225,000 subscribers out of a total urban population of 2.3 million. In addition, during this time, only six people have died in traffic accidents involving rental bicycles. The system has also gained followers: 31 communities on the outskirts of Paris have joined Vélib’, which serves as a model for another 34 French cities. The Parisian authorities stress that Vélib’ has also served as an example for the development of similar initiatives in numerous cities around the world, from Melbourne, Australia to the U.S. city of San Francisco. In 2011, Velib’ achieved profitability and is fully expected to yield profits again in 2012. For Delanoë – a sober and extremely reserved politician who publicly declared his homosexuality in 1998 – the triumph of Vélib’ is also confirmation that his transportation policy, initially controversial, is the right one: a quiet revolution for a city besieged by traffic jams and air pollution. This policy is summed up by the slogan “Paris respire” (literally, “Paris breathes”), omnipresent in signs used to promote bicycle use in the city. But despite its success, the innovative bike-sharing system still has certain drawbacks. “The costs of Vélib’ are very high. The administration and maintenance of each bicycle costs 3,000 euro a year. There certainly could have been a way to achieve the same results for less money,” commented Lesens. In any event, the success of Vélib’ has inspired Parisians to rediscover their passion for cycling, reflected in the world’s foremost cycling race, the Tour de France. Moreover, according to official figures, Parisians make roughly 200,000 trips a day on privately owned bicycles. 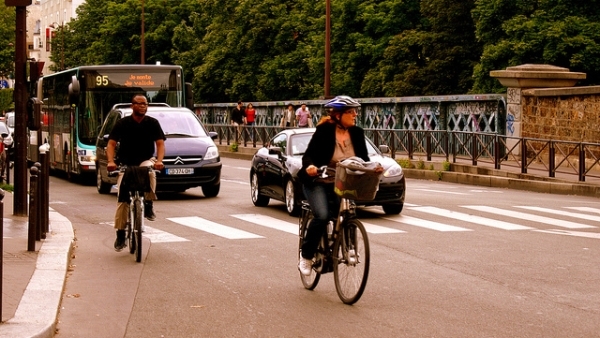 In total, the number of bicycles in Paris has increased 41 percent since 2007. During the same period, motor vehicle traffic has decreased by 25 percent. Bicycles are one component of the urban transportation policy that Delanoë put into practice when he was first elected mayor in March 2001. One of his first measures was the creation of traffic lanes for exclusive use by buses in almost the entire city, in order to speed up their circulation and reduce the space available for use by private automobiles. The municipal government is also participating, in cooperation with communities on the city’s outskirts, in the construction of a non-polluting tram line that will form a connecting ring around Paris by 2020. In addition, some 370 km of bike lanes have been created in the city. On the weekends, motor vehicle traffic is prohibited on the most emblematic streets of Paris. On Dec. 5, the municipal government introduced an electric car sharing system based on the Vélib’ model. Christened, naturally, Autolib’, the initiative has not yet achieved the same degree of popularity as the bike-sharing scheme. But Delanoë is confident that it will have a positive impact on transportation in the city. “When Autolib’ becomes part of the daily way of life of Parisians, like Vélib’ already is, the urban transportation policy will change definitively,” said the mayor, who was reelected in 2008, with 57.7 percent of the votes, to govern the French capital until 2014. Now all Gays can rent a Bike as well as a boy? Not sure. Vélib’ can be definitely considered as a success, but is still having a long time issue (since the launch of the system): the complete lack of information for the users! * The API giving the number of bikes/spaces available at a station for the mobile application has been giving unrealiable information for a few months now. Still no information on that issue, and you can find yourself at an empty station where the app said it should be plenty of bikes available (or the other way, full station and your bike to return) which can be very annoying for a daily basis use of Vélib. This example of Baffling people with large numbers is very similar to the equally misleading publicity from London. The figures are not good for this, or for any other bike share scheme. 138 million trips over five years on 23000 bikes equates to about 3.3 trips per day per bicycle, or roughly 75000 trips each day. The city has 2.3 million people living in the area served by the bikes, and they account for just 0.13% of the trips that this part of the population makes. The figures would seem even worse if we considered the whole metropolitan population of 12 million people. Move on. There’s nothing to see here. No bike-share scheme anywhere in the world has had a major influence on modal share, including the one in Paris. Aren’t your numbers more likely to be outdated considering they are all based on a 2010 report? Mathieu did say data was not being shared.